Seven miles at about 8:10 pace. I did some lifting yesterday, including dead lifts and leg presses, so I'm sore today. Struck out for our cabin in SW Colorado around 2:00 this afternoon. First vacation road trip ever with the dog. Of course he just puked in the hotel room. Fortunately it's the Robber's Roost Motel and they probably won't notice. Great dinner, as always, at Ray's Tavern here in Green River. We love staying in places like this. Moab, Cortez CO, Mesa Verde NP, Durango tommorrow. Beautiful run through the San Juan National Forrest. Followed a dirt forrest service road up the Piedra River for about 3.25 miles with Abby and then the rest by myself. It's a tough, but beautiful, run. According to the sign it's 12 miles to the end of the road. Thinking about bringing a bottle and a gu and doing the whole thing tommorrow or Wednesday. There's also a trail marathon/half marathon in Pagosa Springs on Saturday. I'm thinking maybe. It's called the Turkey Track Trail Marathon and it looks like a lot of fun. Big upgrade. They have wi-fi at the office here now so I just need to walk a quarter mile from our cabin. Signed up for the Turkey Track Trail half this Saturday. AM: Five miles with Abby. Muddy and slippery after an all-night rain. Raining all day too so I'm hanging out in the Archuletta County Library for a while while Ann and the kids do some running around. Soaked in the mineral springs here in Pagosa Springs and so I feel about 30 years younger today. I finally made it down to the end of the road. It more or less is a hump. I start at the cabin which is just a few feet above the Piedra River then I climb the dirt road steadily for about 6 miles. By that time the river is just a tiny ribbon you can barely hear. Had to stop there for a minute to soak in the grandeur of the San Juans and imagine Kit Carson guiding John C. Fremont through here 175 years ago when Carson only halfway knew where he was going. But he was a badass so it didn't matter. Then it's rolling for about four miles and a steep drop with several switchbacks the last two miles to finish right next to the river. Ann and the kids met me there and drove me back. 12.5 miles at 8:10 pace. Heading out for some fishing with Andy at a lake on the Southern Ute Reservation. It probably won't be good because of all the rain, and a trip to Chimney Rock National Monument. AM: Easy run with Abby plus four striders in front of our cabin. Ann went fishing with Andy. I signed up for the Xterra Turkey Track Trail Marathon and Half Marathon intending to run the half marathon. The course is two 13.1 mile loops, hilly and rocky, and about 95% muddy singletrack. After the start, I settled into second place following a Brazillian dude who was running the full marathon. 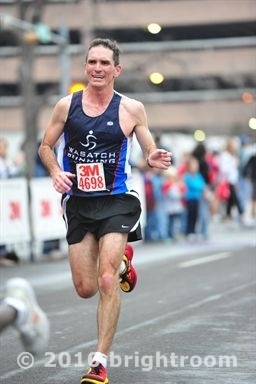 Eventually he built about a 30 second lead on me but I could still see him (I didn't know he was running the marathon). Anyway, we were pretty much all alone and after 3 miles, I figured out why...Brazillian dude missed a turn and I followed him and we got ridiculously lost. When he stopped in the middle of this Forest Service road we began trying to communicate. He was pissed! Talking about how in Brazil trail races are marked every kilometer and such and swearing in Brazillian. He did know the F word in English though. Anyway, we jogged about 3 miles along the road until I came to a marker I racognized from driving in. We made it back to the start line (also the finish line) and the race directors were sincerely upset and apologetic, one even saying that he had "thought about" putting a person at the turn we missed. Here's where it gets really odd for a mostly road racer guy like me. They offered to do a seperate re-start of the race for the two of us and said they would count the times in the official results. After some thought, the Brazillian took them up on the offer and started out on the marathon again after having already run 7 or 8 hard miles. I asked them for an entry in the 10k which was a half hour later and they graciously did that for me. So I started the 10k at 10 am, the same time Abby started the 5k. The 10k course went about 2.5 miles downhill on a supper muddy (lots of rain lately in Pagosa Springs) dirt road and then about 4 miles of rolling singletrack with a couple tough climbs. Anyway, once again I settled into second place behind this youngster who really looked like he knew what he was doing decked out in all his Pearl Izumi Racing Team gear and all. So I was in no-man's land once again just after the 5k running some pretty good splits in the 6:20-6:30 range and really enjoying the challenging course when Pearl Izumi dude comes running back towards me. "Is there a turn-around up there" I said. "No, we ran off the course". He said. At this point, I uttered the F word. It just doesn't pay to play follow the leader! So we started jogging back and I asked him why he thought we were off the course. He said he asked a walking half-marathoner. I asked him why he thought a fat, walking, half-marathoner knew anything about the 10k course. He didn't answer. At this point we encountered the 3rd runner who was a local and assurred us we didn't run off the course. "Man, you guys came a long way back". He said. So we did another 180 and resumed racing but I have to admit, I lost a bit of interest. My goal was to enjoy the run and finish 2nd, which I did. But I finished and Andy was sitting on a log about a quarter mile from the finish with a camera and cheering for me so I spunked up a bit and finished with a little bit of pride. Ran about 7 miles in 49 minutes. So I ended up doing about 13 miles of racing today in 2 seperate races. So I guess I raced a half marathon. I am sad that I couoldn't finish the half which was won in about 1:45. I would have run about 1:30 or so on that course. They had just about the coolest trophy I've ever seen. Spending the night in Monticello, Utah tonight and will be back in Salt Lake tommorrow. Oh, and congratulations to Abby for being the overall women's winner in the 5k!!!! Made in home at 3:30 this afternoon. Did a little hiking and arch exploring along the way topped off with another cheeseburger at Ray's Tavern. Gonna take the day off of running. Good article in my new Outside about Overtraining (OTS) and how it impacts ultra runners. AM: 1 mile marking a course for my new runners then the Gully Longer Run - 7.25 miles in 55 minutes. Pretty good pace. Hot for 8 am. Abby completed the whole Gully Long Run! First run of the summer up at Alta Ski Area. Couldn't quite circle the Albion Basin Campground due to snow, but should be able to next week. I did 13 miles in 1:44 - exactly 8 minute pace. Ran into Blake up at the top which helped. This run starts at about 8,500 feet and goes up to close to 10,000 feet over about 3.5 miles. Then back down of course. Easy warm-up and some stretching then 8 miles on the Porter Rockwell Trail in that suburban paradise, Draper Utah. Ran 57:50. Porter Rockwell was "The Destroying Angel of Mormondom" according to the wikipedia article on him. A good Porter Rockwell quote..."I never killed anyone that didn't need killing". My team is all looking good but it looks like most of them will miss the rest of the summer for family vacations and LDS Church-related activities. All except my daughter Abby who doesn't have to drag handcarts around Wyoming because she's a Presbyterian. PM: Lunch at Ruth's Diner with Ann. I love summer. I got up to Alta at 6:45 am to get in my run before my team arrived at 9. Ran up to the campground and then a bunch of loops. Some snow, but it was fun hopping through it. Took it a little easier than on Tuesday averaging 8:20 pace. AM: 4 mile walk around Sugar House with a little jogging mixed in. PM: 4.25 miles in 32 minutes around the neighborhood. Keeping it flat. Hot! 94 degrees. Although according to The Weather Channel it only "feels like" 89 when you factor in the 11% humididity. AM: 3.25 mile jog around the neighborhood and then a 3.25 mile walk with Andy around Sugar House Park. All I had time for this morning. Missed running Grandma's today. Next year maybe. Check out Blake's race report today. PM: I got interrupted during my morning run by parent stuff so I tried to get in a few miles this afternoom. Fail! Ran one 100 degree lap around Liberty Park and quit feeling like a sluggish turd. I did manage a few high quality strides at the end so that's something. Tomorrow morning I'm going up to Jeremy Ranch at 6 am. The kids can stare at the screens on their devices all morning and let their brains rot. 20 miles around the neighborhood and Sugar House this morning. Time was 2:26:50 for a 7:20 average. Not bad considering I didn't dip under 8 minutes until mile 4. First 20 miler of 2015 and it's not even July! Just realized I'm going to Mormon church this afternoon. #suit #tie #100 degrees! I'll think cool until then. AM: Easy swim and a hot tub soak at the gym while my team was gully running. I'll do an easy run this evening. PM: 60 minutes of trampoline jumping at the wAIRhouse (get it?) with Andy. That has to count as something. I was tired at the end. Then 4.25 miles on the ellipticul machine and 2 miles on the stair master. This completed my afternoon of ancillary training. 8.5 miles on the AHS track. Included 8 x Flying 30s with a half mile jog between each. On a sad note, all the ducks are dying at Sugar House Park. I like ducks. According to the Salt Lake Tribune, about 12 ducks are dying every day due to avian botulism. 9.5 miles out and back on the Porter Rockwell Trail. A little under 7:30 pace. Hot already at 8 am. PM: Light upper body workout at the gym. Swimming, floating, hot tubbing. 14 miles at Alta Ski Area. Averaged 8:07/mile. Was joined by Blake the whole way. 9:57, 9:08, 9:16, 8:49, 7:39, 8:23, 7:59, 8:11, 8:20, 8:43, 6:51, 6:35, 7:17, 6:36. Oh yeah, saw two mooses. One young one hanging around the volleyball court in "downtown Alta" and another one up in the campground. AM: 4 mile walk with Andy and the pooch. We walked around the park - only saw two living ducks and they were just barely hanging on. PM: 60 minutes of "bike riding" on the Lifecycle. 21.6 miles. I might be on to something sustainable in my training. Will have to run a race soon to say for sure. Took the kids to see a movie called "Max" today which has been 100% universally trashed by every critic. They LOVED it! 14.25 miles at Jeremy Ranch with Jon Kotter Esq. 1:46:51 for a 7:31 average. 1. Happy with another 70 mile week. 2. Happy with the consistency lately. 3. I've been paying attention to recovering right and that's been working well. Easy to do in the summer months when I have time to nap, go to the gym to swim/whirlpool/sauna during the day etc. I can almost live like a pro athlete for a couple months. 4. I was not thrilled with how I felt today but when I look back a few weeks, I see that I averaged 6 seconds/mile faster on the Jeremy Ranch Road than I did a few weeks ago. 5. I took the day off yesterday, but the 22 miles on the bike left me a little sore. Not the kind of soreness you notice when walking around, but you do notice 7 miles into a 14 mile run. 6. Need to do some workouts even if that means the mileage drops a little. More importantly, need to NOT WORRY about the mileage dropping a little. 7. Might have to address the persistent tightness in my upper right hamstring that sets in the longer I run and on hills and that I fear would really slow me down the last few miles of a marathon - should I ever decide to run another marathon. AM: Ran 7.25 miles in the gully at 7 am and then did 4 more miles on the treadmill while my kids were running. If I lived in Missouri, I'd vote for Eric Greitens. Plus he's run a 2:58 marathon. 10 miles on the treadmill with 8 x 400 in the middle. Sort of a 400 on, 400 off kind of thing. Started off at 6 minute pace (10 mph) and worked down to 5:27 pace (11 mph) at the end. Finished with a light strength/core workout and a swim. Then I sat and read for an hour while Andy finished his day at camp.